From Copper Center to the copper mines of Kennnicott, Ak. What a trip we left Willow Lake after a nice tour of the handbuilt log cabins and a delicious breakfast of sourdough pancakes at Willow Lake B&B . Jim and Linda are great hosts. We drove south on Richardson Highway to pick up the road east to Chitina. On our way we stopped at the delightful shop run by. 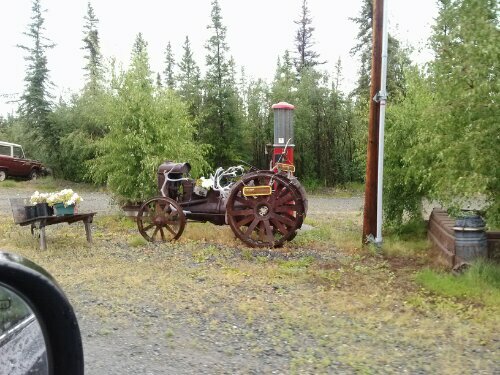 It is a mix of Alaskan art and gifts, convience store and a bit of hardware supplies. Found some goodies and a couple bottles of ice tea. My vertigo is still giving me trouble, still bracing as I walk around. On to McCarthy. 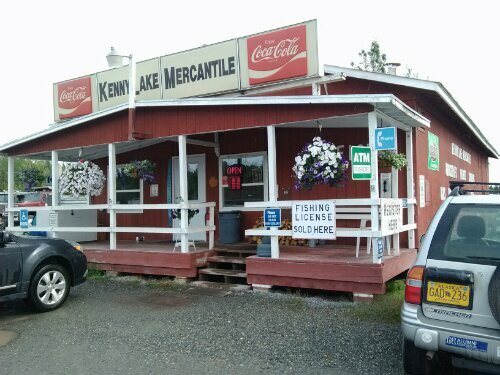 We drove for awhile on Edgerton highway and stopped for gas at The Kenny Lake Mercantile’s General Store . It took me awhile to figure out how to pump gas on old fashioned gas pump. The lady inside really thought something was wrong with me. LOl…she noticed. 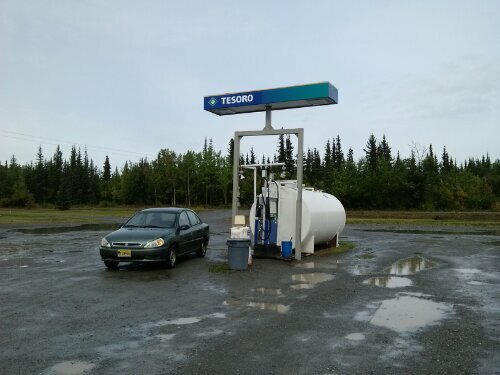 Remember to stop about here, no more gas stations between here and McCarthy/ Kennicott. 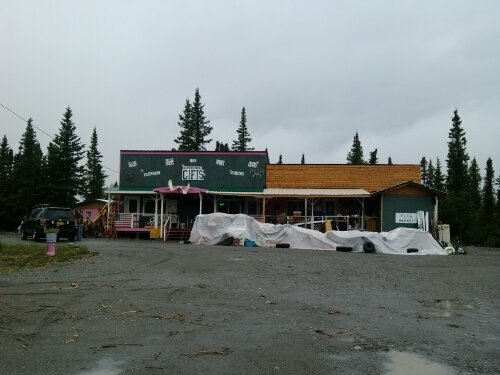 Off like a herd of turtles, we stopped at the Golden Spruce Convienence Storefor sandwiches. Very good food homemade bisscotti to die for, vanilla with i think walnuts dipped in white chocolate and chocolate with walnuts dipped in dark chocolate. Then Carol and I drove and drove, stopping to take photos and Go Pro. So many beautiful photos. We stopped by Chitina, what a quaint town. I loved the Spirit Mountain Arts Art Gallery. It was a big WOW! Beautiful artwork from artists around Alaska. Prints, watercolors, drawings, jewelry, knitted hats, slik scarves and more. I found a nice screen print of silver salmon. After a few hundred shots of Chitna, we got back into our car. 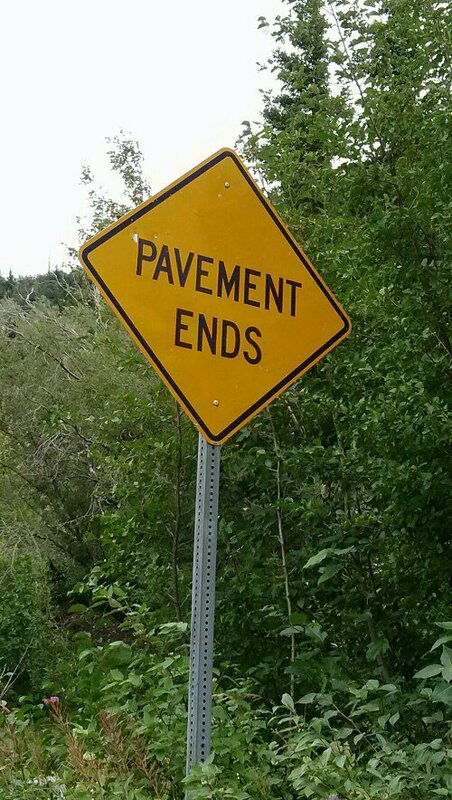 This is where paved roads end.